Fudge! This wonderful, sweet, silky creation is known on Mackinac Island. And so it's time to celebrate. 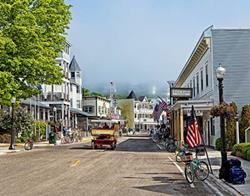 The Mackinac Island Fudge Festival celebrates this delight with music and activities. Plus fudge! 6-8pm Market Street Open House & Art Walk. Visit the art shops, Bed & Breakfasts, and all businesses on Market Street. Music, fudge treats and complimentary beverages. Free event. 6-8pm Children’s Magic & Music on Market Street. Magic by Jamie Andress, music by Gabi Bowditch, face painting, yo-yo tricks, lots of fun! Activities at Community Center, Market Street. 6-9pm Courtyard Shops at the Lilac Tree. Enjoy Michigan made snacks and giveaways. May’s Fudge Shop: First 25 customers to purchase fudge will receive a free slice of fudge cake! Main Street shop on the water side. 11:30am History of Fudge Talk given by Phil Porter at Mackinac Island Library. 12-3pm Family Games at Windermere Point. Games, bounce house, coloring mural, Hula Hoop Contest, Popcorn Dump Race, Egg and Spoon Race, Water Balloon Race and more! 3:30-4:15pm Three Men and a Tenor Concert at Windermere Point, free concert. In case of rain, concert will be moved to Community Hall. 4-5pm Fudge Infused Cocktail Hour, Seabiscuit Cafe. Try fudge inspired specialty cocktails. 4:30-6pm Michigan Craft Beer & Fudge Cruise Sip n’ Sail Pure Michigan Boat Cruises, music by Sonder. 7-7:45pm Three Men and a Tenor Concert at Windermere Point, free concert. In case of rain, concert will be moved to Community Hall. 8pm Willy Wonka and the Chocolate Factory Outdoor movie at Windermere Point, Willy Wonka appearance, popcorn and movie snacks. In case of rain, alternate venue will be Community Hall. 11am-2pm Family Games at Windermere Point. Great Turtle Slow Ride, Sugar Sack Relay Race, fun for everyone. 7pm Scenic Photo Hike with Heather May Begins at Mackinac Outfitters, complimentary samples of fudge from May’s Fudge Shop.